An unexpectedly long server and storage migration left me looking for lunch for my team on Saturday. Google Maps said there was a Subway nearby and in the course of looking for it, we providentially found the Huron Square Deli at 1150 Huron Road in downtown Cleveland instead. Providentially, because I didn't want a Subway, because the Huron Square Deli has of of those ubiquitous '"Hot" Corned Beef' signs in their window and because I'd added it to our Where we're going list a while back. We gave them our "ham-and-cheese-without-the-cheese" order first, then got to bantering about their Corned Beef: Do they think they have the best? What kind do they serve, lean and crumbly or fat and juicy? Did we want provolone or american cheese?(!!) Did we want fries with that? 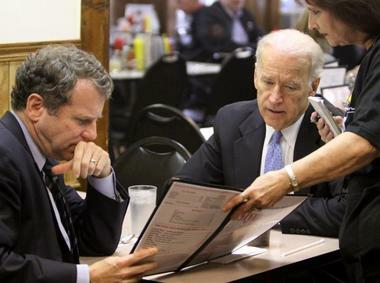 Turns out they do believe they have Cleveland's best Corned Beef. They claim to serve lean and juicy. And yes, we wanted fries with that. And we gave them a really tough time about the "provolone or american cheese" question. I suppose one has to cater to client tastes, but the mere mention made me question their Corned Beef credentials. Well, back at the break room, we opened our parcels and dug in. Very good. Just look at those fries!! Somewhere in there is buried a deli pickle spear, quite perfect in every way. But look at those fries! It's perhaps a bit telling that the fries overwhelmed the sandwich. In addition to being plentiful, they were also perfect. Perhaps it was because we caught them at 10-minutes-to-closing and they needed to offload so many fries. Or perhaps they always serve them so deliciously and plentifully. OK. Enough said. They were good. 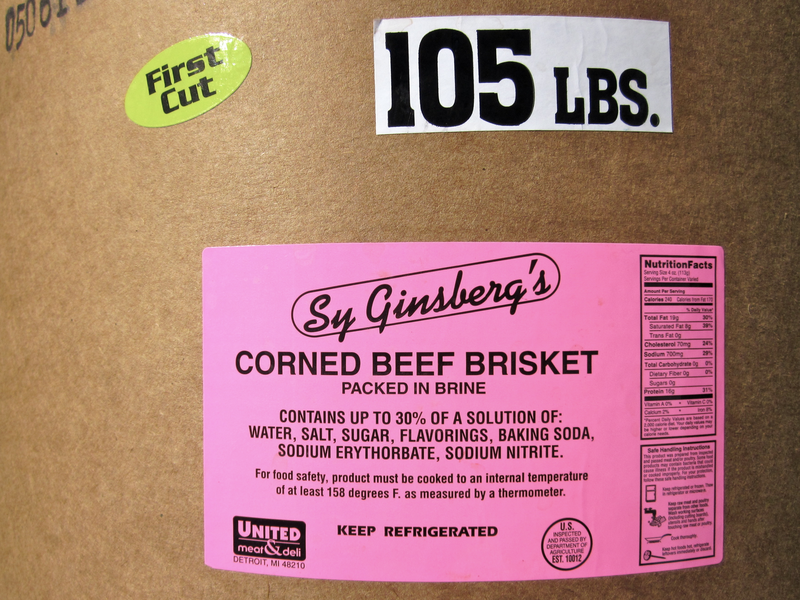 And the Corned Beef? Overall, it was very good. 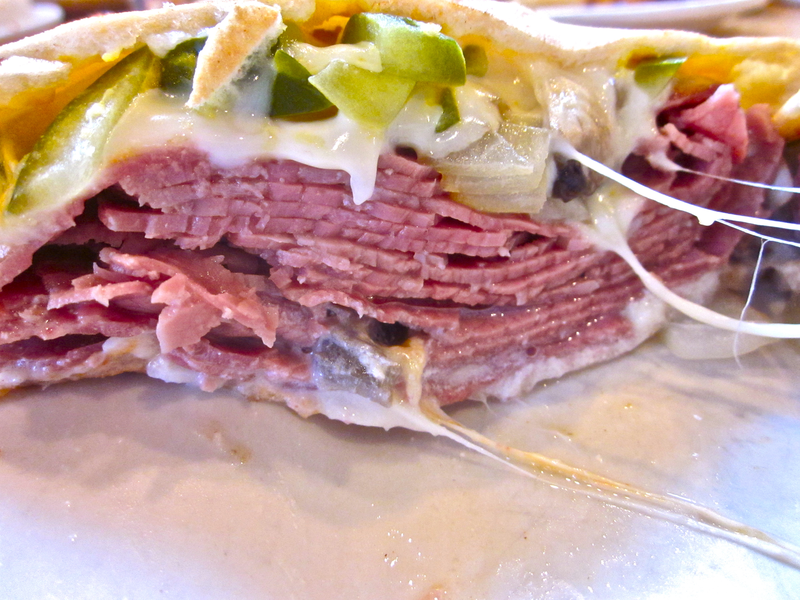 A good, every-day sort of Corned Beef sandwich. 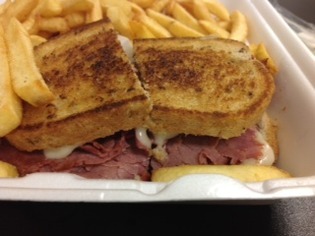 A daily staple sort of Corned Beef sandwich. Not a Best Corned Beef but a Very Good Corned Beef. Now I can add it to our Where we've been list. I look forward to visiting again when I'm in that part of town. I was downtown Cleveland yesterday and needed some lunch so I stopped over to Ontario Street Deli and quickly ordered their traditional Corned Beef on rye with swiss and Stadium Mustard. Carl was very happy to oblige, of course. I think making Corned Beef sandwiches is what keeps that guy alive sometimes! Since I was running late for my next appointment, it taunted me from between those slabs of bread for the next ninety minutes while I raced back to the Heights to talk technology with a local startup. 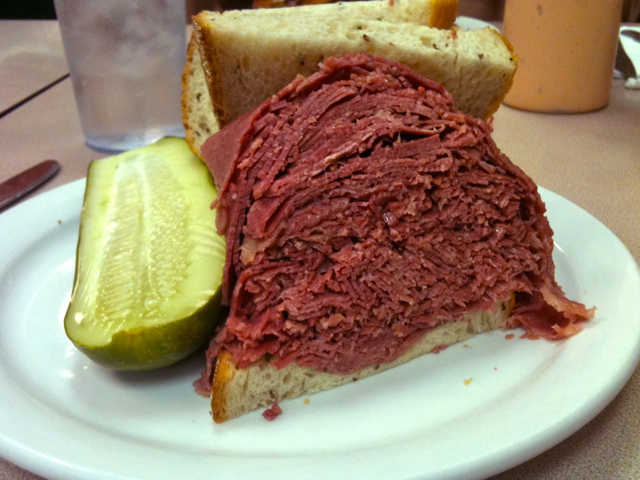 Perhaps the measure of a great Corned Beef sandwich is how long it can wait without being eaten and still taste delicious? I don't intend to wait that long again, so I may never find out. 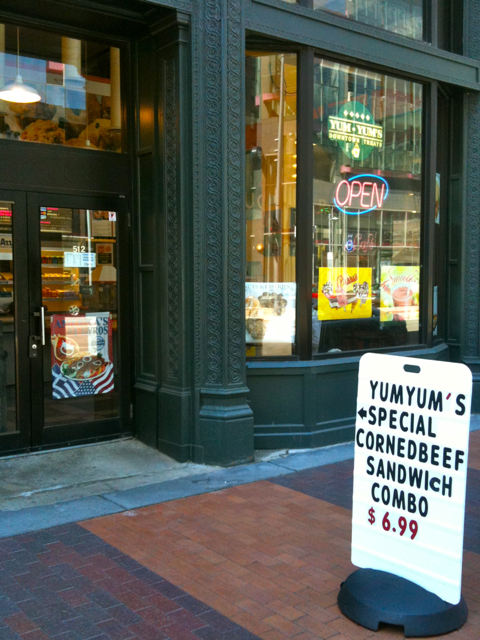 I'm adding Yum Yum's Downtown Treats to the list after seeing their sandwich board on Euclid this past week. 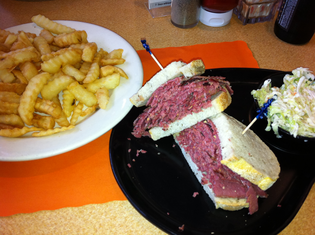 They don't claim to serve the best Corned Beef in Cleveland, but their asking price of $6.99 for a sandwich combo appeals to this cost-sensitive sandwich eater. I wonder how many ounces are on this one? You can find them at 512 Euclid Avenue, Cleveland. 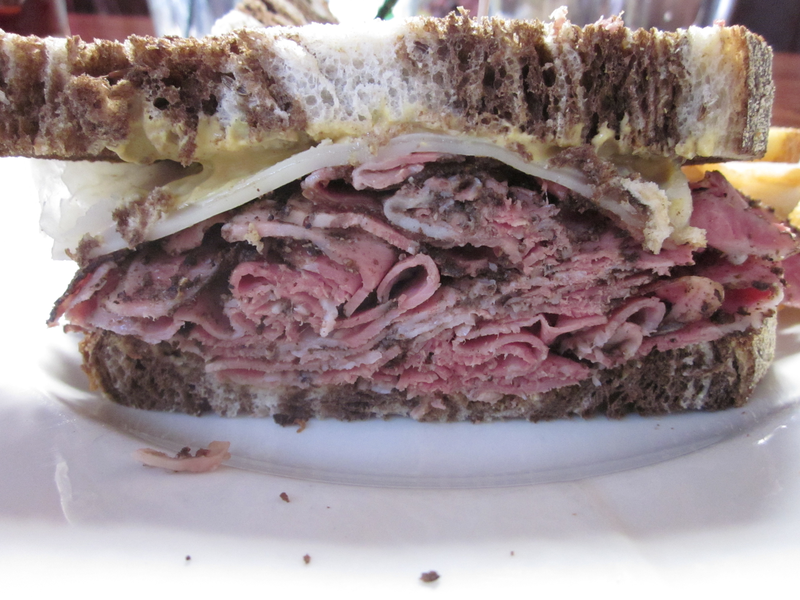 There's no doubt that Slyman's Restaurant holds the region's imagination for Corned Beef. 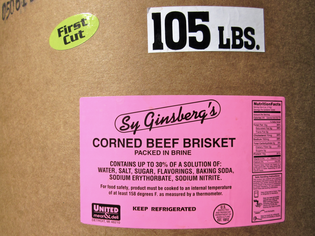 From being "the place the president visited" (President Bush dropped by in 2007) to serving the "biggest" Corned Beef, nothing about Slyman's is disappointing. My colleague and I chose a Friday during Lent to avoid the massive crowds that on a normal day threaten to swamp this little "hole in the wall". The takeout line (call, don't email) was long but running quickly and yet there were a few tables to spare at 12:30 when we arrived. If you're here for the Corned Beef (and who isn't! ), a quick glance at the menu should be all that's needed. 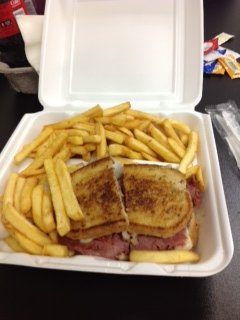 My friend chose his traditional Reuben (hold the Sauerkraut) and I got the Corned Beef. The first thing we do is pull out our phones to take pictures (his and mine). I didn't have a ruler or measuring tape, but it was high, probably the tallest I've had yet. We guessed about the weight, figuring about eight or nine ounces. Our waitress (she was friendly, attentive and yes, very busy) shattered our estimate by telling us that each one is eleven-point-five ounces. 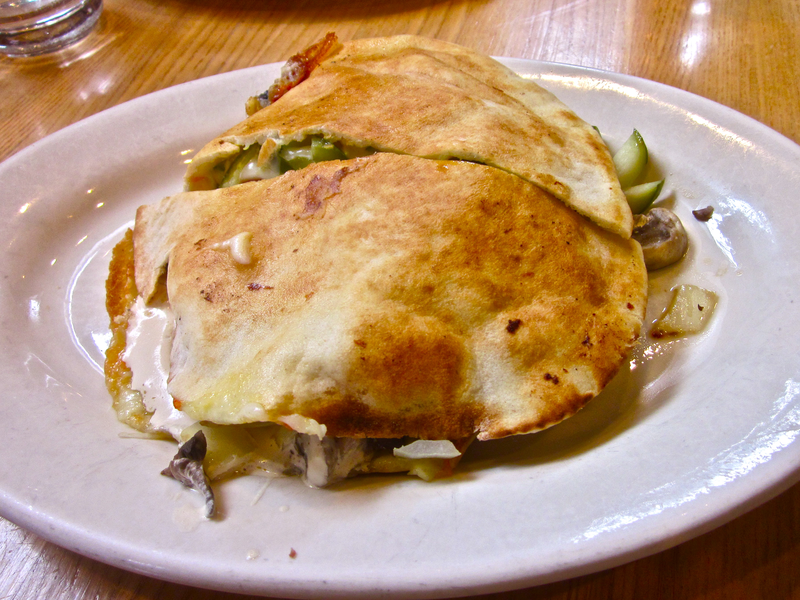 No matter how you slice it, stack it or compress it, that's an awful lot of sandwich. I'm not going to get into "size matters" arguments mostly because no matter how big you make your sandwich, someone else can always add another ounce. You may be trying to lift a slice of rye bread the size of a hubcap, but the place down the road will trot out one the size of a spare tire. 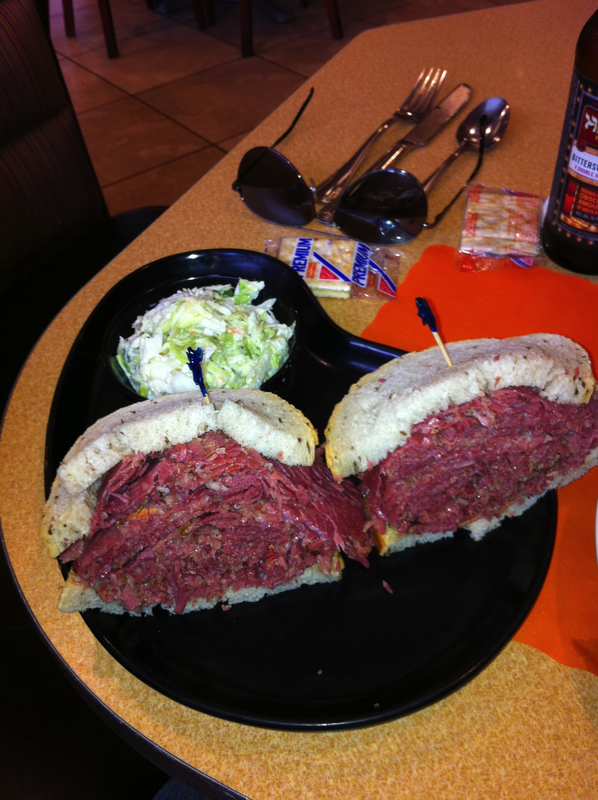 On a personal note, a Corned Beef sandwich needs to have at least a 2:1 Corned Beef-to-bread ratio in order to be truly enjoyable. Less than that and you'd be better off eating tuna fish. On the upper side, there's something about 16 ounces—an entire pound—that sounds like a good place to stop. As it is, one calorie calculator I visited put that 11.5 oz sandwich at 980 calories (sans pickle)! How was it? It was truly great. A real Cleveland classic. Without a doubt, a great Corned Beef sandwich. 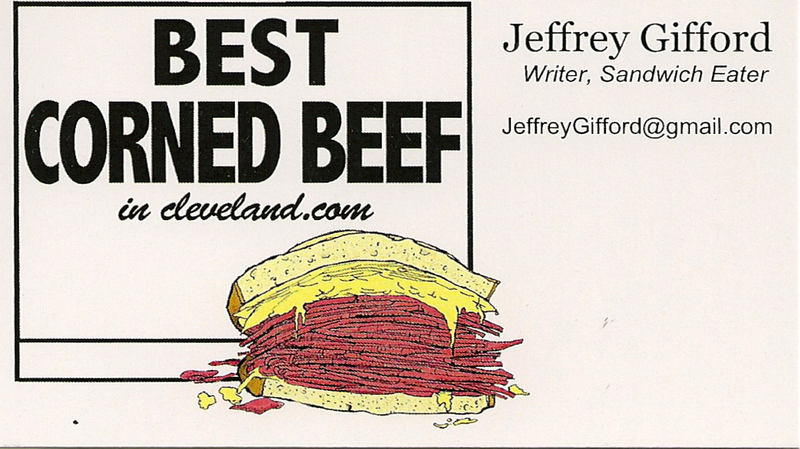 My friend would argue that it is Cleveland's Best Corned Beef. As for me, I'm a bit more empirical: ask me when I've tried them all. 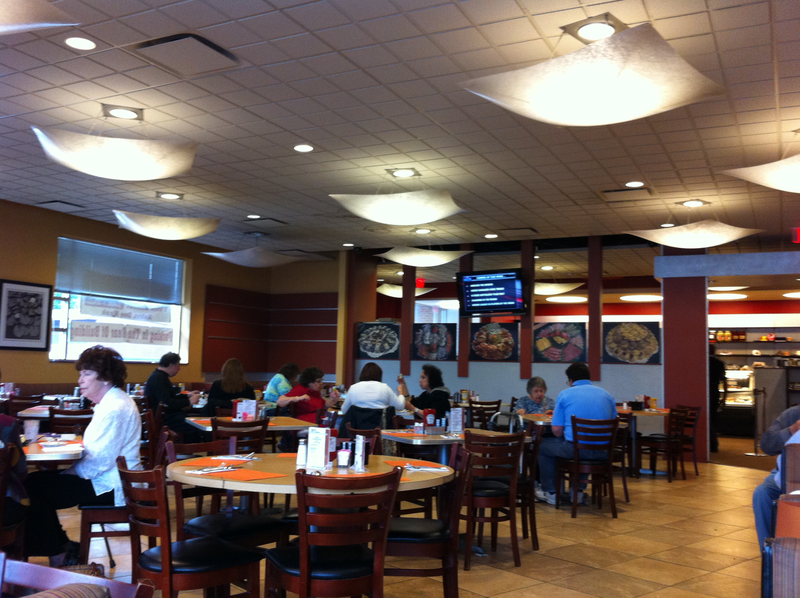 Until then, when I'm tired of sampling sub-Best fare, I'll come back to Slyman's to reset my expectations. Alexa (AKA Cleveland's a Plum) makes an Irish Mimosa with Corned Beef.